– can you taste the difference in the wine? – why take this approach and is it difficult and expensive to do in a cool climate like Ontario? Here are my Top 20 Organic Wines for Earth Day April 22, and year round. I’ve posted several of my recent reviews of Ann’s wines below. If you’d like to see more of her reviews as well as those for other biodynamic and organic wines, please join my wine reviews. This is the first video chat using the new Google + Hangouts On Air live broadcast. We’re pioneering the use of this social media tool in the wine world and are excited about bringing together the old and new worlds of wine and technology. This is the first in a regular series of informal conversations that will introduce you to dynamic winemakers, sommeliers, chefs, writers and wine instructors around the world. I’ll also be chatting with those outside of the wine world (musicians, actors, tv personalities etc) who have a particular passion for wine. At the same time, you’ll also learn about various aspects of wine from how it’s made to how it’s marketed as well as practical tips like choosing from a restaurant wine list and pairing wine with food. Do you know someone whom I should interview? E-mail me at natdecants@nataliemaclean.com. Ann Sperling, who has dubbed this wine The Winemaker’s Palette, has “painted” a lovely wine from the superb 2007 vintage in Niagara. Aromas of raspberry, boysenberry, tilled earth and woodsmoke are front and centre. The palate is dry and fruity, yet fine tannins come through for balance. This Cab Sauv, from the great 2007 vintage, is beautifully constructed. Enjoy it tonight or cellar it for up to three years. My note: Blackberry liqueur richness and depth with full-on hedonistically ripe fruit and a dark spice finish. Hard to believe it’s only 12% alcohol, but it’s also a pleasant surprise for such flavor. Pair with: roast leg of lamb, slow-cooked meat dishes. Drink: 2011-2015. 260281 12% XD 750 ml $33.95 Score: 90/100. Rich, savoury and juicy with aromas of redcurrant and cranberry. This wine was aged in both French and American oak. No fining agent was used for this organic wine so it’s suitable for vegans & vegetarians. Pair with: braised beef ribs in a cabernet sauce, steak. Drink: 2011-2013. 312086 13.3% D 750 ml $22.95 Score: 88/100. I love it when I find a wine that’s so low in alcohol yet so packed with flavour! It means you can enjoy it over an evening without falling asleep on the sofa at 7 pm. This wine is liquid refreshment: light floral notes, white peach and melon. It’s slightly off-dry (a touch of sweetness) which makes it perfect for dishes with a little sweetness or spice, such as glazed ham or light to medium curries and Asian fare. The bonus is that this wine is organic. Pair with: seafood, salad, pork. Drink: 2010-2013. 249078 9.6% MD 750 ml $14.95Score: 87/100. Join us at Cava for a Winemaker’s Dinner with Ann Sperling, winemaker at Sperling Vineyards, Clos du Soleil and Southbrook Vineyards, and Peter Gamble, consulting Winemaker of Ravine Vineyards and Benjamin Bridge. Ann & Peter are two of Canada’s most esteemed winemakers, and we are delighted to have them. Spend an evening with us to showcase some of their finest bottles. Natalie: When Ann Sperling was a child she had every conceivable version of a farm tool in child size, a hoe, a shovel so that she could help on her family’s farm in B.C to make wine. 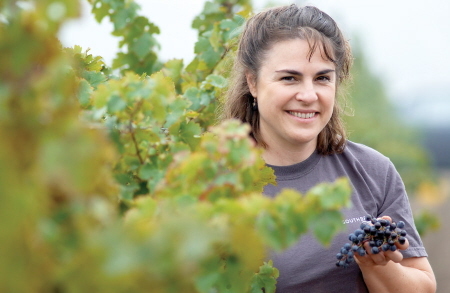 Now that she’s a winemaker at Niagara’s Southbrook Vineyard, she says she has an intuitive feel for the vines and that when she walks among them, she can tell, within seconds their age and vitality, kind of like the vine whisperer, Ann welcome! Natalie: Hi! Your intuitive sense for wine making is very much part of your approach to farming which is biodynamics. Can you tell us a little bit about how biodynamics differs from organics when it comes to making wine? Ann: I guess a simple way of looking at it is it’s like extreme organics. Biodynamics is an organic form of farming in which we have fewer products that we buy in to make the operation work. There’s something called the whole farm system or whole farm concept where the idea is to raise or grow as many inputs as we need to make our vineyard healthy. Natalie: There’s a lot to talk about biodynamics, perhaps a lot of misunderstanding. Some people characterized it as witch craft for wine making or astrological because there’s stars and sun and moon are involved. I’ve even heard of burying the cow’s horns with manure on the vineyard, do you do that? Ann: Yes, in fact we do. That’s known as preparation 500. The compost that results from that process of burying a horn with the crushed cow manure inside it, is that we get a very highly concentrated microbial mix within that compost. We can use it as a sort of culture to invigorate our soils with the right micro-organisms that serves the vines to supply the nutrition. Natalie: I know that this approach helps with the vine health but do you really taste the difference that biodynamics makes in the taste of the wine? Ann: Yes, we do. We had a wonderful example a couple of years ago with Chardonnay. We had the opportunity to ferment a few barrels for another winery. They had conventionally grown grapes and we had our biodynamic grapes. When we tasted those barrels side by side, what was really obvious was the texture and the complexity of the biodynamic wine compared to the conventional one which is much simpler. If you just look at the alcohol or the acidity, there were some similarities. The difference came when you put the wine your mouth. Natalie: So, that’s more of results of the vines and the grapes following seasonal changes as opposed to chemical ones, is it? Ann: Yes. What we see with a conventional vineyards where chemical fertilizers are kind of dominant is that it really drives the vine so you get early lush growth. The vine is being manipulated by chemicals rather than responding to the seasonal cycles. As the summer approaches the days get longer and then as fall approaches the days get shorter. The vine really should respond to that and start the ripening process as the days are getting shorter and mature the seeds within the berry. By the end of the fall those seeds are mature. That is a sign that the flavours are mature within the berries. Natalie: It sounds like a detox program for vines. They’ve been in rehab and now they’re healthy and living free. Ann: There’s actually a UC Davis study that shows that after a period of time, with organic and biodynamic viticulture practices in place, that the vines do develop their own resistance and their own resiliency. This can be proven by looking out for … one element would be the thickness of the skins … because of that stimulation of the skin surface kind of like suntan for humans, the berries are actually healthier. Where it affects red wine, for example, is if you have thick skins and well develop tannins, that means better colour and more flavour and texture in the wine. Natalie: Is it harder to do biodynamic farming or even organic farming in a cool climate like Ontario where you have more mildew and rot and pests compared to Chile where it’s warm and they have lots of irrigation? Is it tougher up here? Ann: In Niagara, we definitely have a humid climate and we see every mildew and mildew related pest known of viticulture. It’s a challenging region to grow grapes in. In fact we find that now that we have our systems in place and our vines are in that stage of having their own resiliency that we’re producing our crops cleaner and more consistently than often conventional farmers are doing. In a conventional situation things seem to be more erratic and when you get a string of bad weather, often the fruit will rot very quickly. In our situation we’re always managing and we’re just staying ahead of things enough that the fruit stays healthy and we always harvesting high quality fruit. Natalie: So there are also many benefits on you know, richer or more authentic wine in terms of expressing where it comes from. Why are more Ontario wineries and wineries across Canada adopting this? I know increasingly there are but it’s still a very small percentage of producers who take this approach? Ann: Even though biodynamics has been around since the 1920’s, it hasn’t been a part of the conventional training. You can’t go to any enological or viticulture program that offers a degree in Canada or the US and study biodynamics. You have to go to special schools for it or take special courses. It’s not in the mainstream but anyone who’s really interested in it has to pursue their learning themselves and with a lot of motivation. There is a lot of interest from our students that are coming out of The Niagara College and The Brock Programs. Every year we bring in new interns and we try to train them and expose them to our method of farming. It is a very clean way of farming and when you spend much of your time and most of our lives at work and we have people who spend every day during the spring, summer and fall within the vines so as an employer it’s a great way to feel good about offering the best conditions for all the workers. Ann: There actually have been a couple of studies recently out of France that have shown that vineyard pesticides from conventional farming are showing up in the older farm workers and causing neurological problems for them. Natalie: My goodness, well that’s a serious stuff. So what is your big project? Do you’ve always got something on the go? What’s up next for you either Southbrook or some of the other properties that you’re involved with? Ann: Well Southbrook is an ongoing project for me. We do have a lot of things on the go including our flock of sheep as well as our wine making. I have a couple of projects that I am excited about. My husband and I have a very small vineyard in Argentina where we grow Malbec. Our wine that will be called Versado will be new on the market in Ontario later this year. We’re doing all the things needed to bring that wine into Canada. My family’s vineyard in the Okanagan Valley, called Sperling Vineyards, is launching our Sparkling wine. We started that program in 2008 and so after 3 years on the lees, our classical method Sparkling would be available also late this fall. Natalie: Well, three time zones, when do you sleep, Ann? Ann: I sneak it in here and there, Nat. Ann: About a month ago, I was tasting with the wine writer and had gone through a number of the wines that are new releases from 2010 and 2009, here at Southbrook and we came to the final wine that I was presenting that day, a Chardonnay from the 2009. As this person was tasting the wine, tears actually came to her eyes before she even spoke. She said that she never experienced that sensation before but that the wine was so beautiful on her palate that she just couldn’t hold them back. Natalie: Well! Words fail the wine writer that’s hard to believe; but great. Natalie: Well, good for you. Your wines certainly are marvellous and I’ll be posting some reviews of them along with this video. Remind us, Ann, of your website. You probably have a few but let us know where we can find you online? Ann: So for Southbrook its southbrook.com and for Sperling Vineyards we’re at sperlingvineyards.com. Very soon we’ll have a versadowines.com for our Argentine Malbec. Natalie: Ann, so you’ll be running those three websites in your spare time I take it? Natalie: Thanks for chatting with me today, Ann, it’s been a real pleasure and keep up the good work.